The Epworth Sleepiness Scale (ESS) of Johns (1991) is very often used as a screening method for detecting the global daytime sleepiness and fall asleep in sleep disorders, especially used in hypersomnias. It is asked retrospectively, how high is the probability to fall asleep in eight everyday situations. The scale has a 4-step response format, in which values between 0 and 3 (0 = never to 3 = strongly agree) must be marked and results are added up a total maximum value of 24. Following Johns (1991, 1992, Johns & Hocking 1997) a cut-off value > 11 indicates a pathological daytime sleepiness. Standardization studies for the German-speaking countries were presented by Büttner et al. (2004c) and Sauter and colleagues (2007). The study found that 85% of healthy persons achieved a total value < 10, which corresponds to the calculated cut-off values in other studies (Johns 1991, Johns & Hocking 1997). The test-retest reliability of the ESS was calculated by Johns (1994) and based on a survey after five months in 87 healthy medical students. It was rtt = .82 (p <.001), even the quality of internal consistency was confirmed (Cronbach's alpha = .88 (p <.001). The ESS has in spite of it being subjective and a global assessment of daytime sleepiness (Johns 2000) has a very good validity. At a cut-off value > 10 it shows a high sensitivity of 93.5% and - high specificity 98.4%. The ESS is thus a highly reliable and valid procedure. The short implementation time and simple evaluation makes it very economical and cost effective. In addition, it can also be used for measuring the effectiveness of nCPAP therapy. Nevertheless the ESS does not lend itself to capture gradually different levels of sleepiness (Sangal et al. 1997b) and that four of the eight items have very low selectivity (Rühle et al. 2005). For Those Who Can’t Wake Up On Time And Fatigue Throughout The Day. 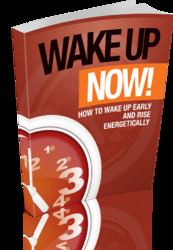 Now You Can Wake Up Early And Be Super Energetic Everyday.